We generally have 1 small, 1 medium, and 1 large hardtail mountain bikes available for short notice hire. Do please check in advance if you are sure you want to hire – we can get bikes of different sizes to suit with a few days’ notice. 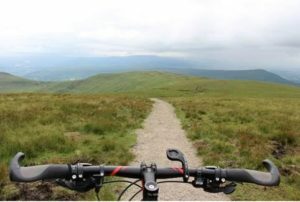 The bikes are replaced each year (supplied by our friends at Drover Cycles) and come equipped with disc brakes, helmet, lock, multi-tool, pump and spare inner tube – we supply all you need for a day out in the Brecon Beacons. If you want an easy start, there is a flat canal path right from Brecon, where you can ride as far as you like without too much sweat, and a nice cafe in Talybont on Usk makes a good lunch/tea and cake stop. If you have the legs for it there are plenty of hilly loops with great scenery and all levels of difficulty. We can give you a map and directions. Bike hire per day (or part day) direct from Bridge Cafe £30 per person. Half day £20 per person. Transfers with bikes 45 pence per mile, if you want to do a one way ride, eg Taff Trail.